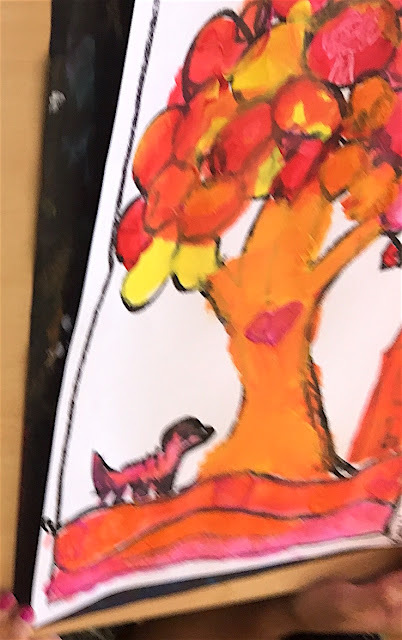 Third Grade artists at Park elementary have been really getting into their paintings this fall. They learned about the Artist Heather Galler and are in the process of painting their own folk art style tree. They noticed one of her trees were mostly warm colors and made connections with the great autumn colors were are seeing in Michigan right now. They also saw flowers painted in her trees which we all love seeing flower blossoms on our trees in the spring as well. They are really free to explore painting with different tools and making different kinds of marks and designs. The various tools of choice include cotton swabs, sticks, paint brushes, and fingers! They they are learning many different techniques and are free to express themselves within their tree's patterns and designs along with the other things they chose to add in their landscape. Some students painted a home, barn, church, bird or dog. Folk artists paint things that they are familiar with and tell more about the artist. Folk artists may have some art background as our students do from our art special but have not been formally trained beyond grade school. We have some pretty impressive folk artists at Park Elementary and they really take great pride in their work!